Harkin was serving in the Black Watch Regiment, who he represented at football, when First Division Middlesbrough bought him out of the Army after seeing him play for his Regiment against Celtic in a Scottish Cup-tie in September 1906. He soon made the Middlesbrough first team and played thirty League games at Left Half in his first season there. He also played twice in the F.A. 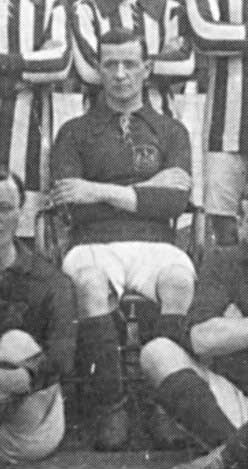 Cup in his first season at Ayresome Park and played a further nine League games to bring his tally to thirty-nine League games before leaving to join Non-League Broxburn Athletic in 1908 and then Bathgate in 1909. He was brought back into League football by Leeds City in August 1910 and went straight into the first team at Right Half and missed only seven games in his first season. His second season saw him miss just six League games as he held a stranglehold on the Right Half position. He left to join Non-League Darlington in 1910 and was later signed for Non-League Coventry City by his former Leeds Manager Frank Scott-Walford in 1914. The coming of WW1 saw Harkin re-enlist with the Black Watch and he fell in action at Amara, Iraq on 22nd April 1916.